Coronary sinus ostial atresia (CSOA) is a rare congenital anomaly. Most cases are identified at autopsy, incidentally diagnosed intraoperatively, or are detected by late-phase coronary angiography. Usually, the coronary venous flow is drained through the left superior vena cava (LSVC) into the innominate vein (INV) or through the intracardiac Thebesian veins into the right atrium.1–5) We present a 12-month-old male infant with known tricuspid and pulmonary atresia who was diagnosed with CSOA during diagnostic catheterization prior to undergoing a cavopulmonary shunt, followed by successful repair of the CSOA. A 12 month-old male infant with known tricuspid and pulmonary atresia was admitted to our hospital for cardiac catheterization to evaluate his hemodynamic status prior to undergoing a bidirectional Glenn shunt (BDG) procedure. He was known to have undergone a left modified Blalock-Taussig shunt at 1 month of age, as well as an enlargement of an atrial septal defect using cardiopulmonary bypass at 4 months of age, and it was at this time that a coronary sinus orifice was intraoperatively identified. He had presented with dyspnea on exertion and cyanosis with systemic oxygen saturation of 85%. A chest X-ray showed a cardiothoracic ratio of 60% and a marginal decrease in the left pulmonary blood flow. Echocardiography showed that a left ventricular ejection fraction was 68% without significant valvular regurgitation. Electrocardiography showed the left axis deviation, right atrial hypertrophy and left ventricular hypertrophy without any ischemic change. Suprasternal echocardiography did not show any abnormal blood flow draining into the INV. Cardiac catheterization revealed that the pulmonary to systemic blood flow ratio, the mean pulmonary arterial pressure, the pulmonary arterial index, and cardiac index were 0.83, 9 mmHg, 154 cm2/m2, and 4.69 L/min/m2, respectively. However, a late phase left ventriculography image following angiographic evaluation of LSVC which was performed to investigate a veno-venous collateral showed retrograde blood flow through LSVC. Therefore, a 5Fr-left Judkins catheter was introduced from the femoral vein and advanced through the INV and the persistent LSVC into the coronary vein. 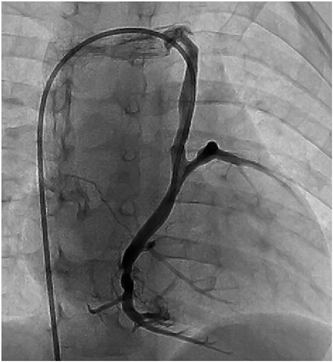 A selective coronary venogram revealed that the coronary sinus ostium was absent and a retrograde coronary venous flow was observed through the persistent LSVC draining into the INV, i.e. a CSOA was identified (Fig. 1, Movie). When he was 19 months of age, we performed a BDG, repair of the coronary sinus orifice, and ligation of the LSVC. 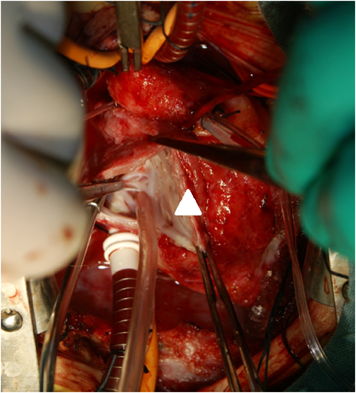 A re-median sternotomy was performed and after establishing cardiopulmonary bypass with bicaval cannulation, the left Blalock-Taussig shunt was ligated and divided. Following cardiac arrest using cold cardioplegia and a right atriotomy was performed, and a thin membrane was observed at the orifice of the coronary sinus (Fig. 2). We cut this membrane with enlargement of the orifice to adequately view the middle cardiac vein. Subsequently, the LSVC was ligated superiorly and divided, and after the right superior vena cava was divided, a bidirectional cavopulmonary shunt was performed. The patient was successfully weaned from the cardiopulmonary bypass and recovered uneventfully. A selective coronary angiography performed at 2 weeks after the BDG procedure showed adequate coronary venous flow draining into the right atrium. The patient was treated with oral administrations of asprin, diuretics and digoxin. 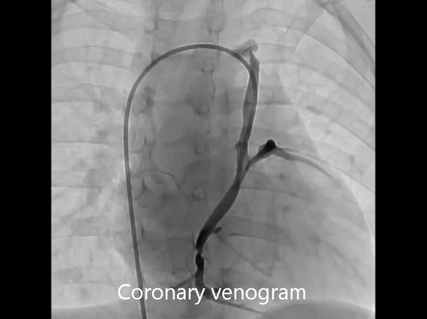 Movie Selective left coronary angiogram showing retrograde blood flow through the left superior vena cava. CSOA is occasionally associated with complex congenital heart disease. In patients with CSOA in whom the LSVC is the only drainage pathway and single ventricle physiology requires a Fontan operation, a cavopulmonary anastomosis or ligation of the LSVC can increase the coronary venous pressure and decrease myocardial perfusion, which could result in death.2, 3) Therefore, it is important to identify the CSOA prior to performing a cavopulmonary anastomosis in patients with single ventricle physiology. Tadokoro et al.1) have reported a case series comprising 6 patients with CSOA, among whom 2 patients were demonstrated complex congenital cardiac anomalies, including tricuspid atresia and double inlet left ventricle. However, the CSOA was diagnosed after the cavopulmonary anastomosis in both cases. CSOA associated with single ventricle physiology is potentially fatal because of the resultant disturbance of coronary circulation. Especially, it is cautious when the ligation of the LSVC is planned at the same time of cavopulmonary shunt. In the present case, the CSOA was not detected using late phase left ventriculography images. We concluded that meticulously performed coronary angiography or aortography evaluation is essential to identify CSOA. We identified the coronary sinus orifice when he underwent an enlargement of atrial septal defect at 4 month of age. Although the reason why the CSOA was acquired before BDG procedure remained unclear, an increase in the right atrial pressure might result in developing a proliferative change around an orifice of the coronary sinus. We describe a rare case of a 12-month-old male infant with CSOA and tricuspid atresia who was diagnosed by a careful performed angiography prior to undergoing cavopulmonary shunt procedure. This work has received no specific grant from any funding agency, commercial or not-for-profit sectors.